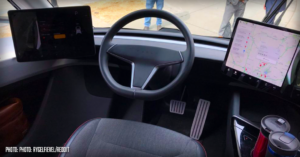 The Tesla Semi was recently showcased in Sacramento, CA for the CALSTART Advanced Tech Vehicle Display and the 2030 Clean Transportation Summit Reception, and it was in the area long enough for some enthusiasts to capture detailed photographs of its interior. The images reveal a Model 3-esque interface, a mysterious third pedal, and a vehicle that is battle-scarred from thousands of miles of real-world testing. Story by Simon Alvarez / www.teslarati.com.